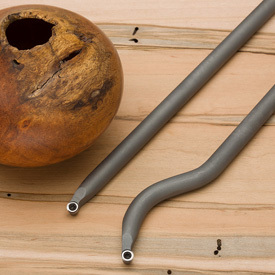 Straight Hollow-Pro Rocket Tool: Works for most hollow vessel shapes. It also performs very well when turning open bowls, boxes, scoops, etc. Comments On Aug 16, 2013:I saw Mike Jackofsky demo these tools at the 2013 Super Wednesday at Craft Supplies and Utah Symposium. Between Mike Hunters cutter and manufacturing along with Mike Jackofskys design and experience, they hit a home run! I love the tool. When it comes to the #1 cutter, its proven to me that smaller is better.